Today Manchester’s streets played host to hundreds of the shambling undead in an attempt to break a Guinness world record and also raise money for charity. Sadly the record wasn’t broken (a mere 160 Zombies short!) but a great and slightly weird time was had by all! Emma and I all Zombified – I attempted to go as Dead Risings Frank West, just a little deader than usual! Constabulary Braaaaaaaaaains! This guy was a great sport, kudos. …and certainly not the Pubs! All in all, really good and random fun! They’re going to try and break the record again in October, so if Zombies are your thing, head on down! Tilt Shift Time Lapse Kyoto! Awesome pictures! Nice to see you got quite the crowd. I’ve put a link on my blog so people can come see your photos. I was fortunate enough to be in Manchester yesterday and catch this spectacle – it certainly was an amazing site and you’ve got some great pictures there. 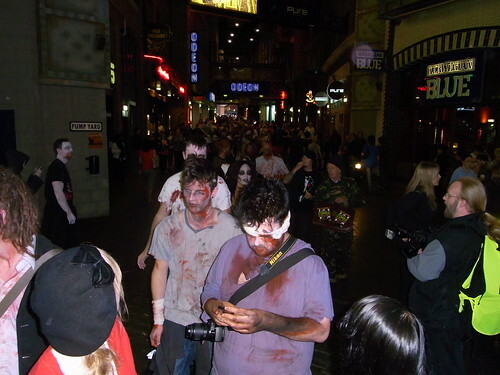 The Printworks was absolutely packed with zombies! I found this on a google search for “Manchester Zombie Walk” – excellent pictures! I didn’t see the zombie postman or zombie shopper! Whoooo! Me and my dad are on this!!! My dad is the postman and i’m next to him, yaaaayyyyyy!!!!!!!!! Yeah somehow I seem to be ranking ok on google for this particular post! During the walk I was straggling quite near the back, glad I did though else I would’ve missed these characters! Just had a look at your pics on Flickr, you got some great ones! That’s awesome! your dad’s makeup was amazing, and the way he kept trying to deliver that bloody letter was classic, I can email over the pic if you like? The walk was on the North West Tonight news, not sure if you saw it (or if you’re even in the North West region). Found you on Google this morning as well so you must of got picked up by them pretty quickly. Had a look at your pics as well – some great ones there. Aw no way, I saw you outside the Printworks as we were all heading back in! I didn’t get a picture though i’m afraid but i’m sure someone else has! Hats off to the police that day, everything ran so smoothly! Good news! I’ve been looking at other peoples pics on flickr and think i found you click here and here! There a fancy dress rock nite at the Millpound pub in the cebtre of stalybridge next to tescos on Fri Oct 30th and theres a prize for best !! Sorry wasn’t me, didn’t make it to this years walk 🙁 hope it was fun! hOur company offers a wide variety of non prescription products. Look at our health website in case you want to to feel healthier with a help generic supplements. Our company offers a wide variety of pills. Look at our health contributing website in case you want to feel healthier. Our company offers a wide variety of non prescription products. Look at our health portal in case you want to feel better with a help generic supplements. Our company provides non prescription products. Visit our health contributing website in case you want to feel better. Our company offers a wide variety of non prescription drugs. Visit our health portal in case you want to to improve your health with a help of generic supplements. Our site offers a wide variety of non prescription drugs. Look at our health site in case you want to to improve your health with a help health products. Our company provides a wide variety of non prescription products. Look at our health website in case you want to look better with a help of generic supplements. Our company offers a wide variety of non prescription products. Take a look at our health site in case you want to to feel healthier with a help of health products. Our company offers a wide variety of non prescription drugs. Take a look at our health site in case you want to look better with a help of generic supplements. Our company offers herbal health products. Visit our health contributing portal in case you want to strengthen your health. Our company offers supreme quality supplements. Look at our health contributing portal in case you want to improve your health.